Southern Living Magazine September 1996. Terra-Cotta Pots on Cover. Articles inside include A Year in the Land of Cotton, The Fences of Seaside, Shrimp on the Bayou, Terra Cotta Pots, Tailgating at Ole Miss, Football, Fall Squash, Simple Souffles, and more. Filled with great Photographs and advertising. Magazine is complete and in good condition, wear at edges. 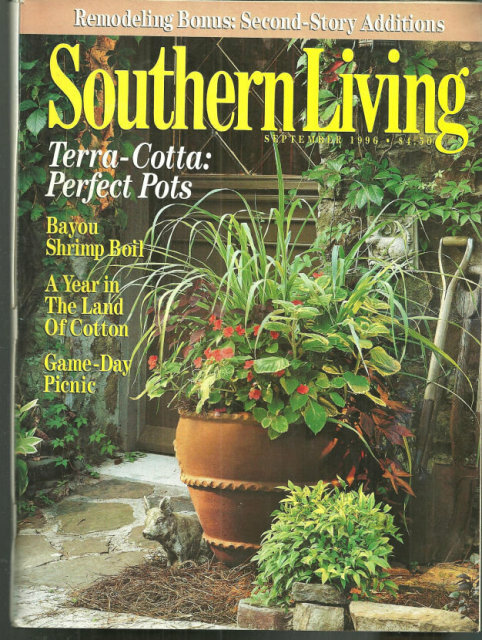 Items Similar To "Southern Living Magazine September 1996 Terra Cotta Pot"